"J. Kenji López-Alt is the Managing Culinary Director of Serious Eats, and author of the James Beard Award-nominated column The Food Lab, where he unravels the science of home cooking. A restaurant-trained chef and former Editor at Cook's Illustrated magazine, he is the author of the New York Times best-selling cookbook The Food Lab: Better Home Cooking Through Science." I have been a fan of Kenji's work since he was at Cook's, so when the email from Kirkland Tap & Trotter (sister restaurant to Craigie on Main) came, advertising a special dinner with Kenji, that would showcase fried chicken made from his recipe, I was on it. I convinced Carol to accompany me, despite the hefty price tag ($75). The restaurant was packed and I was seated next to a woman who introduced herself as Helen. Perhaps it was her Russian accent, but I immediately suspected it was Helen Rennie, author of http://www.beyondsalmon.com/, a seafood blog I enjoy reading. Not wanted to seem like a stalker, I asked her what she did and she mentioned her cooking school. That is when I knew it was her for sure. What a treat, meeting Helen and eating Kenji's fried chicken all in one night! The meal started with Kirkland's "Lacinato Kale & Apple Salad, Fourme d’Ambert cheese, walnuts, roasted red onion vinaigrette" and "Housemade Farmhouse Terrine, port-soaked dried fruits, pickled mustard seeds"
The kale was thinly julienned, coated in the minced apples and walnuts. It was one of the best kale salads I have had. The terrine was delicious, as well. We asked for seconds, and thirds. I loved the port-soaked dried fruits and will have to steal the idea. The fried chicken was the main event and it came with thyme cream biscuits, mashed sweet potato, stewed green beans and a red cabbage slaw. The chicken was buttermilk brined, and twice fried for crunch. 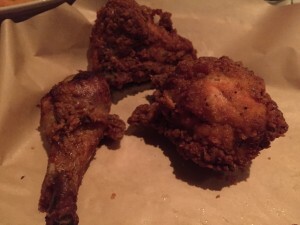 I had 2 drumsticks, which were outstanding – crisp and flavorful. I mistakenly grabbed a breast piece (I thought it was a thigh). Alas, even Kenji can't keep white meat from being dry. 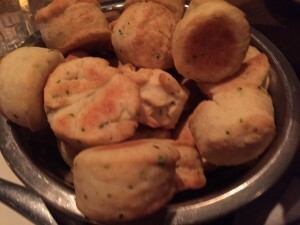 The biscuits were tender, but needed a little more salt. I thought the rest of the sides were good; the greens beans were the best of the bunch. Dessert was "Mary's Apple Pie." I don't know who Mary is, but the regular Kirkland menu lists "Mary's Peach Pie" so maybe the pastry chef? Either way, she makes a mean apple pie. 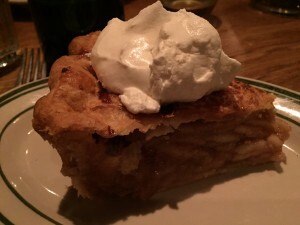 The crust was perfect and the apples were exactly the right texture. The bourbon whipped cream was the perfect finish. I convinced them to pack up the last slice for me to take home to Steve.